The CURBED blog post on Chatham Square is full of sarcastic comments by supporters of the Chatham Square plan. They are saying things like "It is simply an outrage that these improvements are being made to our city's streetscape! 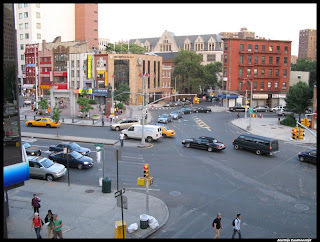 We must continue to have dysfunctional traffic layouts and crummy pedestrian environments! and "The proposed layout is clearly the better option"
"Supporters of the Chatham Square reconstruction plan on this blog are basing their fondness for it on diagrams that were made public in LATE nov. 08. Bulldozers are scheduled to move into Chinatown July 09. Those diagrams were only made avail to the public because CHINATOWN residents and businesses DEMANDED that they be made public at a small meeting with DOT reps. two WEEKS prior to the 2nd ever public hearing on Chatham SQuare. HAd the residents and businesses NOT demanded the info be posted on the DOT website and subsequently on the CB3 website the public at large would STILL be denied access to the plan. THe DOT, despite requests to do so, NEVER provided a single handout , nor pamphlet, in English or Chinese at any meeting ! Chinatown residents and businesses were denied access to the plan prior to a public hearing scheduled during the busy Christmas retail season, and were told that in January bids for construction were already going out. How can any community make any decisions on a plan's safety , efficiency, quality, or legitimacy if it has less than 12 days for the entire community to review it? The English and Chinese press were DENIED access to the materials presented prior to the DEc. 2nd 08 hearing ( the 2nd public hearing for Chatham Square). Reporters had to describe in Chinese two hours worth of complicated diagrams, traffic flow patterns,and changes that would last generations in their newspapers. This was wholly irresponsible on the part of the City AND DOT. IT was not an oversight, it was deliberate. The Chinese community had to fight to get the diagrams you salivate over with tooth and nail. These plans you so readily accept DO have trees in them ,yes they are cherry trees - glad you saw that detail. What you didn't see and didn't even know about was that the plan lacks something much more important than the TREES you fight for with such vigor - it lacks any pedestrian safety plan. I make no apologies for fighting against a plan that has pretty plazas and Cherry trees when I know that those are on the diagrams to draw attention away from the fact that there is no supporting DATA to show us that it is indeed a safe plan. The CB3 traffic engineer has reviewed the plan and suggested to the Chinatown community that there are parts of this plan that don't work. No one denies that Chatham Square needs to be redesigned - it was NOT designed by Chinatown in the first place lets not forget - we're living with a failed plan - we don't want it to FAIL again. We are listening to our residents who traverse this square daily, and to CB3's traffic engineer. You cannot possibly support a plan that lacks certain basic pedestrian safety data, and one that incorporates crash stats that end at 2005. Chinatown has been fighting like Hell to get the data we need to make rational and important decisions unfettered by drawings with trees and plazas. I'm saddened that so many of you supporters do so without attending a single Chatham Square Task Force meeting, or even bothering to understand that it is WE in Chinatown that have to live with the consequences of the DOT's heavy hand - our neighbors in Brooklyn, Battery Park City, NJ, and Williamsburg will also suffer from this if WE are not VIGILANT. "